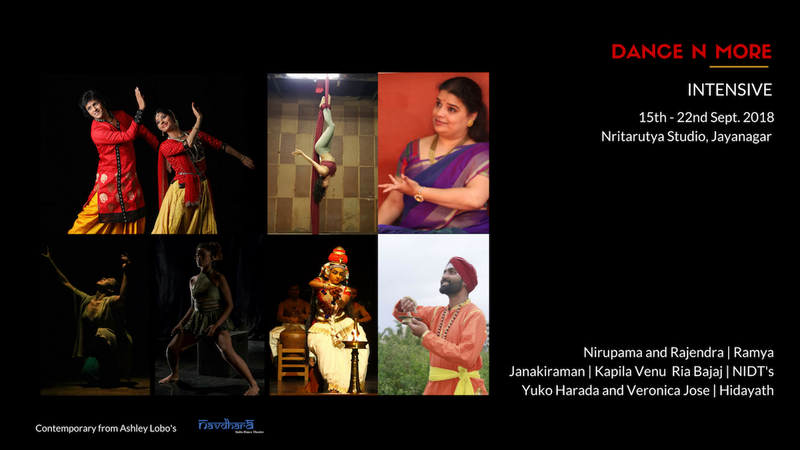 Nritarutya presents its Intensive as part of our Dance N More initiative, which focusses on capacity building of artists. Our Intensive offers artists a unique opportunity to learn 6 dance forms, with world-renowned gurus and teachers, in an environment most conducive to learning, exploring, experimenting, and development. 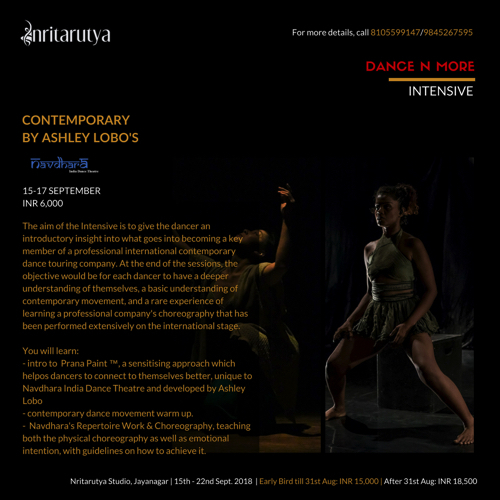 The idea of the Intensive is not only to give a unique learning experience but also to enable artists to adapt to different movement vocabularies from classical to modern to folk to contemporary. 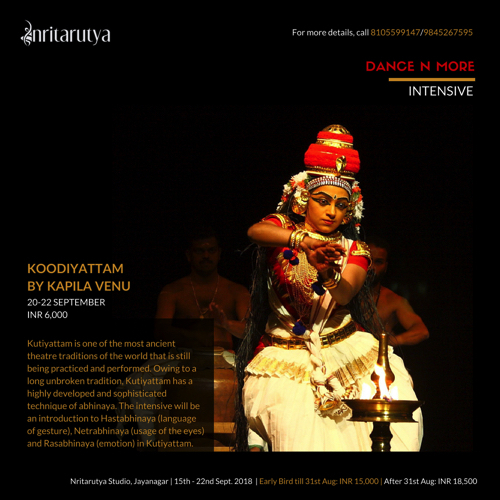 It is a rare opportunity where an artist gets to learn the nuances and movements of classical and modern, from eminent teachers, giving one a detailed understanding of ancient art forms of India, as well as Indian contemporary and modern movements. Join us for these eight days, which will challenge your body and mind, and expand your physical and mental threshold. 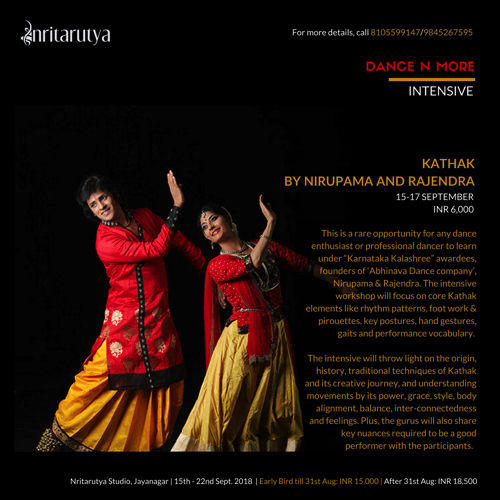 Write to madhuri@nritarutya.com / ananya@nritarutya.com or Call 8105599147/9845267595 for more details. Kathak is a rare opportunity for any dance enthusiast or professional dancer to learn under “Karnataka Kalashree” awardees, founders of ‘Abhinava Dance company’, Nirupama & Rajendra. The intensive workshop will focus on core Kathak elements like rhythm patterns, foot work & pirouettes, key postures, hand gestures, gaits and performance vocabulary. The intensive will throw light on the origin, history, traditional techniques of Kathak and its creative journey, and understanding movements by its power, grace, style, body alignment, balance, inter-connectedness and feelings. Plus, the gurus will also share key nuances required to be a good performer with the participants. Kamsale is unique folk-dance form performed by the devotees of God Mahadeshwara. It combines the religious fervor and martial dexterity, while the brass-made musical instruments are played with rhythmic clangs. 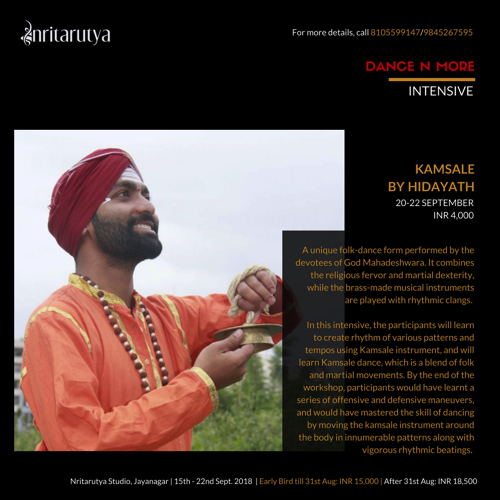 In this intensive, the participants will learn to create a rhythm of various patterns and tempos using Kamsale instrument and will learn Kamsale dance, which is a blend of folk and martial movements. By the end of the workshop, participants would have learnt a series of offensive and defensive maneuvers, and would have mastered the skill of dancing by moving the kamsale instrument around the body in innumerable patterns along with vigorous rhythmic beatings. We will be working on active stretching techniques which will help strengthen muscles and improve flexibility. The participants will experiment with various climbing techniques, routines, wraps and drops on the fabrics. We will focus on knitting known and new techniques and skills together to create seamless routines with artistry. At the end of both sessions, the participants will put together a routine to a song they choose. The aim of the Intensive is to give the dancer an introductory insight into what goes into becoming a key member of a professional international contemporary dance touring company. You will learn an intro to Prana Paint, a sensitising approach which helps dancers to connect to themselves better, unique to Navdhara India Dance Theatre and developed by Ashley Lobo, and contemporary dance movement warm up. The intensive will also take you through Navdhara’s Repertoire Work & Choreography, teaching both the physical choreography as well as emotional intention, with guidelines on how to achieve it. At the end of the three sessions, the objective would be for each dancer to have a deeper understanding of themselves, a basic understanding of contemporary movement, and a rare experience of learning a professional company’s choreography that has been performed extensively on the international stage. Koodiyattam is one of the most ancient theatre traditions of the world that is still being practised and performed. Owing to a long unbroken tradition, Koodiyattam has a highly developed and sophisticated technique of abhinaya. The intensive will be an introduction to Hastabhinaya (language of gesture), Netrabhinaya (usage of the eyes) and Rasabhinaya (emotion) in Kutiyattam. 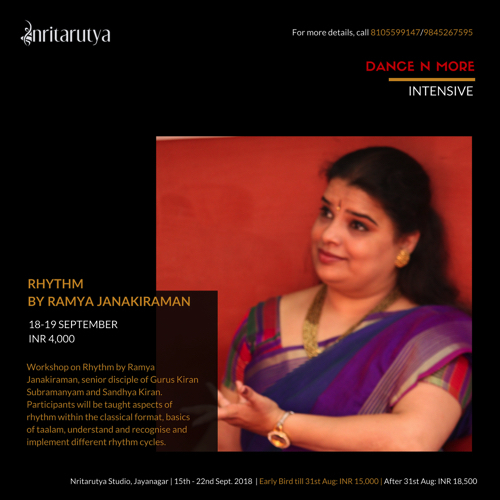 Workshop on Rhythm by Ramya Janakiraman, a senior disciple of Gurus Kiran Subramanyam and Sandhya Kiran. Participants will be taught aspects of rhythm within the classical format, basics of taalam, understand and recognise and implement different rhythm cycles.